The Joshua Tree, Yucca brevifolia, is a member of the Agave family. Until recently, it was considered a giant member of the Lily family, but DNA studies led to the division of that formerly huge family into 40 distinct plant families. The Joshua tree is a monocot, in the subgroup of flowering plants that also includes grasses and orchids. 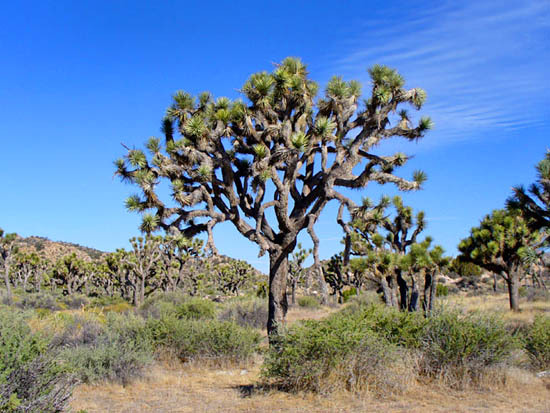 The Joshua trees life cycle begins with the rare germination of a seed, its survival dependent upon well-timed rains. Look for sprouts growing up from within the protective branches of a shrub. Young sprouts may grow several inches in the first five years, then slow down, averaging one-half inch per year thereafter. The tallest Joshua tree in the park looms a whopping forty feet high, a grand presence in the Queen Valley forest; it is estimated to be about 300 years old! These trees do not have growth rings like you would find in an oak or pine. This makes aging difficult, but you can divide the height of a Joshua tree by the average annual growth of one-half inch to get a rough estimate.The Joshua tree provides a good indicator that you are in the Mojave Desert, but you may also find it growing next to a saguaro cactus in the Sonoran Desert in western Arizona or mixed with pines in the San Bernardino Mountains. Joshua Trees were named by Mormon pioneers after the biblical figure Joshua, comparing their sprawling limbs to his outstretched arms, guiding their travels.